Forming the west wing of the 18th Century Corsewall House, Garden Cottage has wonderful sea views across Loch Ryan. 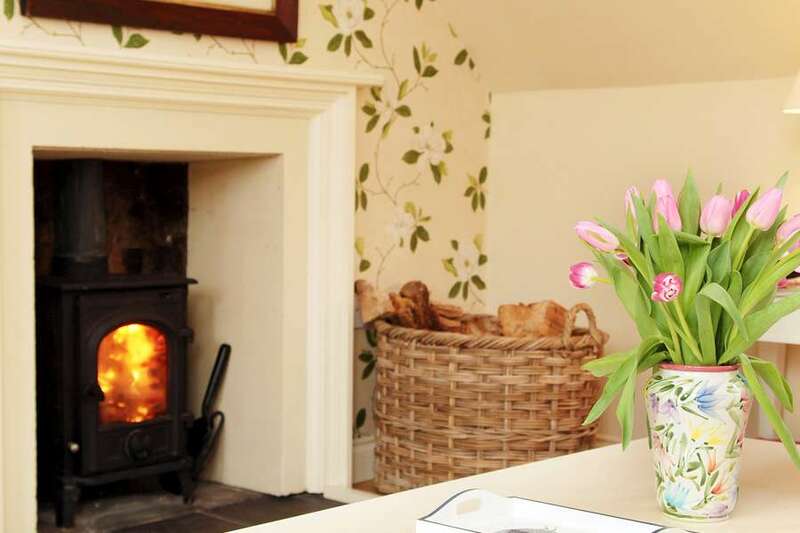 Recently restored, with three bedrooms, this luxury self catering cottage comfortably accommodates six guests. 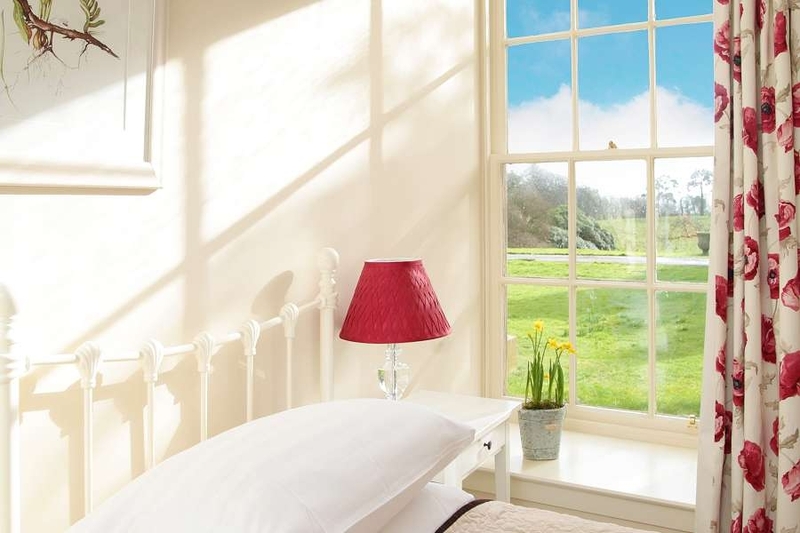 During quieter months, the cottage can be let for four guests, based on four people sharing two bedrooms and during the winter, we also offer a price for two, based on two people sharing the ground floor bedroom. 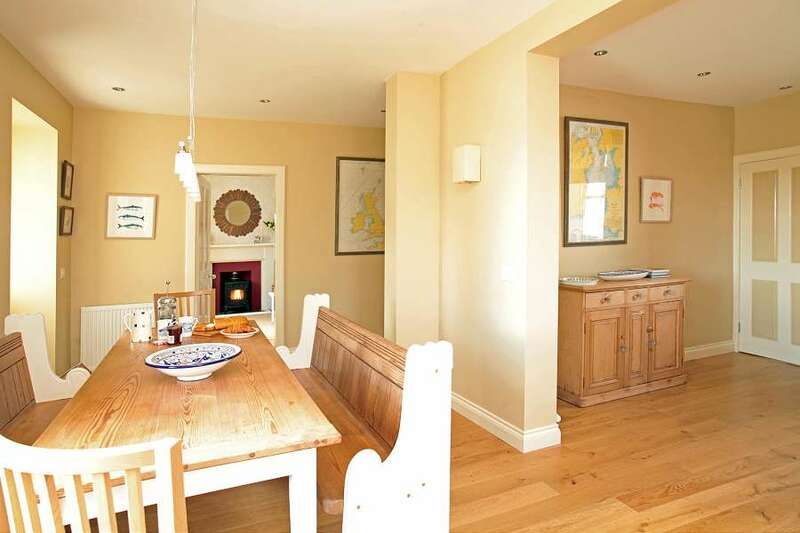 The living area downstairs is open plan with a stylish kitchen including a Belfast sink and large dining table. The spacious sitting room is south facing and overlooks the extensive estate gardens, which in spring burst with colour from the rhododendrons and azaleas. 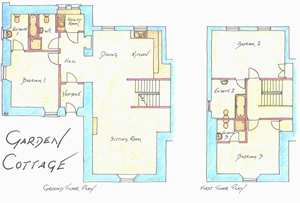 There is a double bedroom on the ground floor with an en suite bathroom. 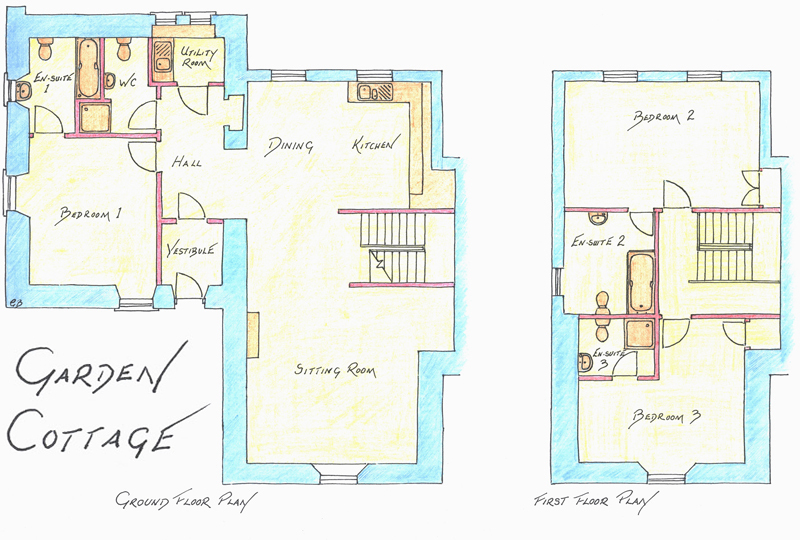 There is also a shower room & WC and a utility room. A traditional wooden staircase leads upstairs to a twin and a double bedroom with a bathroom and en suite shower respectively. Located in over 20 acres of gardens and woodland adjacent to Corsewall House, there are lots of walks around the estate and down to the sea you can enjoy. In late January and February, the woods feature charming drifts of snowdrops followed by daffodils and in April and May the hue turns to purple with acres of bluebells. There is colour in the gardens almost all the way through the year starting with camellia from January to March, followed by a riot of colour in April and May as the rhododendrons and azaleas – pinks, reds, creams, yellows, purples and white – come into flower. Indeed, one of our rhododendron, known as Christmas cheer, comes out in mid December. The autumn sees the hydrangeas providing colour all the way through to November. There is oodles of wildlife to spot – from roe deer and hares to barn owls, woodpeckers and most importantly, this area is one of the last bastions of the red squirrel. The cottage comes complete with its own red squirrel feeder – where you can watch any number of cheeky red squirrels feeding ferociously all day. Our record spotted at one of our feeders is currently six. Walk down to the sea to the shore on Loch Ryan and around Wig Bay and The Scar – a circular walk along Loch Ryan shoreline and back into the village of Kirkcolm. The Scar, a sandbank which juts out into Loch Ryan, is home to one of the largest colonies of nesting migrant terns in the region. From an historical perspective, during the Second World War, Wig Bay, was used as a base for the flying Catalina boats – you’ll see evidence of this on your walk and also throughout the woods at Corsewall Estate, which was requisitioned by the Royal Canadian Air Force during the War. We’ve got lots to keep children busy outdoors on the estate. The woods immediately beside the lawns close to Garden Cottage and Stables Cottages are a dedicated children’s fun zone. There’s a 60-foot zip wire, which has been well tested by children (and some adults) alike! Next door, there’s also a climbing frame, which comes complete with a climbing wall, lookout house with binoculars to spot pirates/baddies, a very whizzy slide, three swings, including one for toddlers and a terrific back to back glider. Additionally, kids can bounce to their heart’s content on the 14-foot trampoline on the edge of the lawns. There’s a campfire area in the woods – perfect for toasting marshmallows. We have a two man tent which guests can pitch in the woods so children can have an outside night adventure and get closer to the great outdoors. Finally, for smaller children, we have wendy house with a toy cooker and lots of picnic/cooking paraphernalia and a pretty veranda. 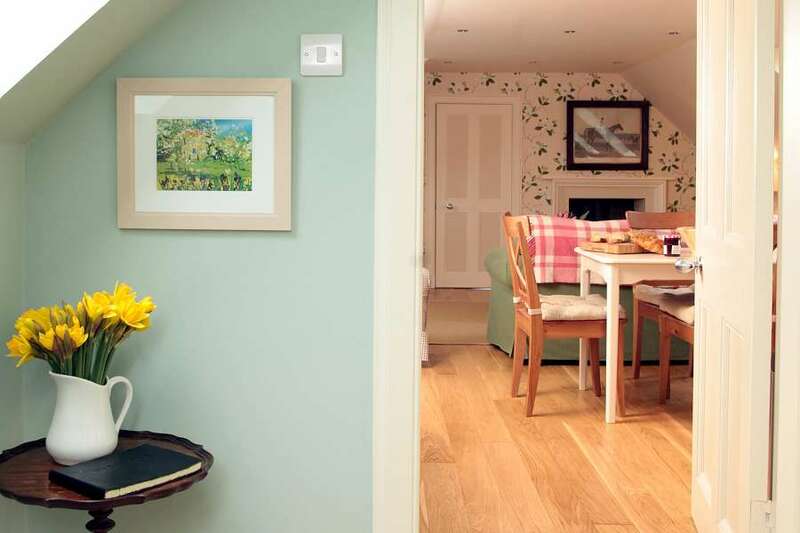 The cottage is equipped with a flat screen television, Freeview Box, DVD player, a Roberts digital radio and a Bluetooth speaker, WiFi, a selection of board games, books and classic films. 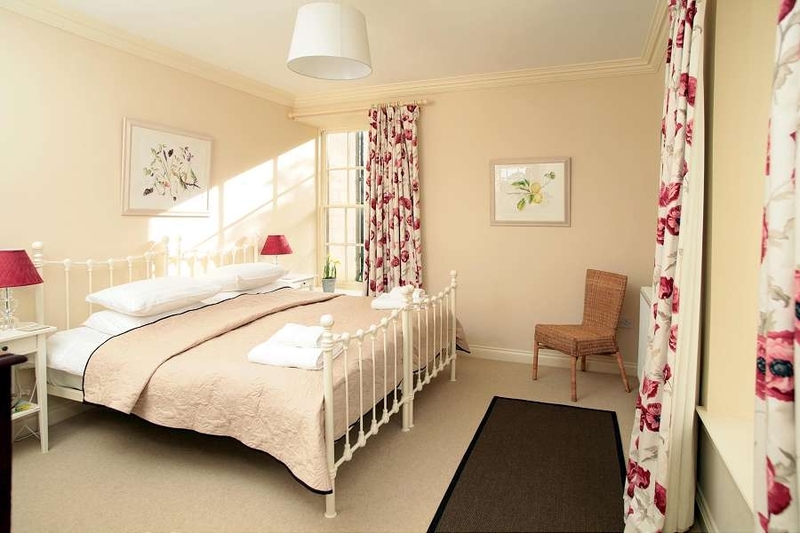 The beds come with super thick, feather-filled duvets, all bed linen and large fluffy towels. It also has a dishwasher, washing machine, fridge-freezer, hob and electric double oven. 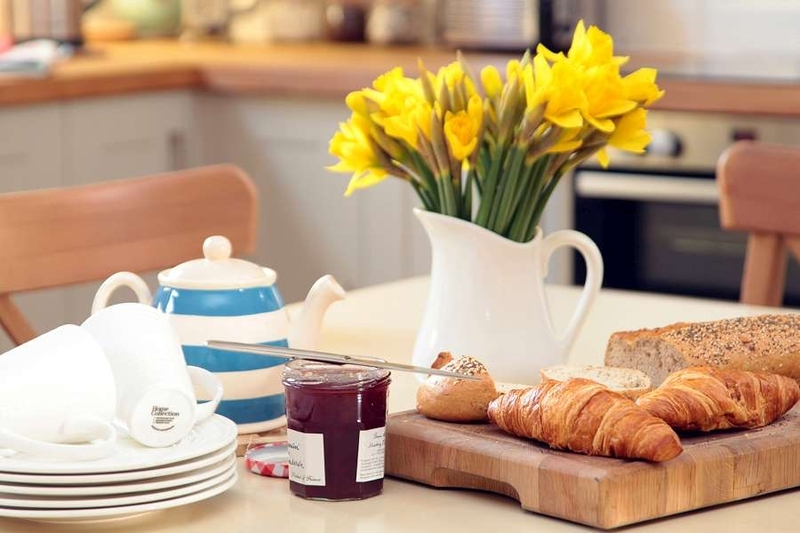 We provide a welcome pack for guests on arrival including a jar of our incredibly edible, home-made Corsewall brownies, milk, bread, jam, butter, tea, coffee and fresh flowers from the garden (when in season). You’ll find the cottage well equipped with the general basics too from washing up liquid, bin bags to washing powder and loo roll. Garden Cottage has its own private garden area including garden furniture and a barbecue. A cot and high chair are available on request.